For a property with such a long name, it’s really a simple math law. The multiplicative identity property states that any time you multiply a number by 1, the result, or product, is that original number. 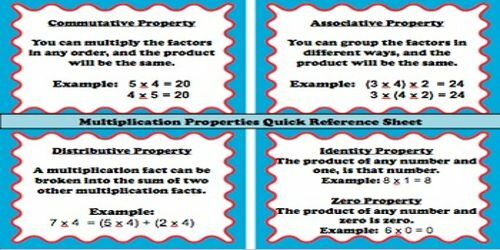 Commutative property: When two numbers are multiplied together, the product is the same regardless of the order of the multiplicands. For example: 4 * 2 = 2 * 4. Changing the order of factors does not change the product. Multiplicative Identity Property: The product of 111 and any number is that number. The product of any number and one is that number. For example 5 * 1 = 5. 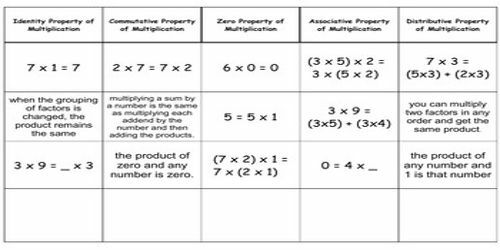 Zero Property of Multiplication: When any number is multiplied by 0, the product is 0. 8 x 0 = 0.